Carry pistols discreetly, securely and comfortably with the Gould & Goodrich B812 Inside/Outside Pants Holster. 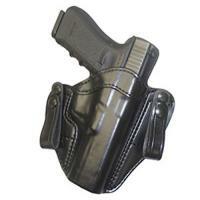 The B812 holster fits snugly against the body for maximum comfort and concealment. Standard inside waistband (IWB) belt loops with directional snaps, coupled with built-in belt slots, allow for maximum versatility and ease when switching between IWB and OWB carry. Designed for ultimate customization, a tension screw allows users to set the level of friction for an ideal personalized draw. The innovative design with reinforced opening ensures the mouth stays open, allowing for effortless re-holstering. Constructed from premium leather with reinforced stitching, Gould & Goodrich's B812 Holster is guaranteed to last.